FYI: I will be hanging onto summer for as long as I can. I love the long days of summer. And lazy days at the pool. Movies in the park. Ice cream after a hot day. And all the summer food; fresh fruit, grilling, fruit, and oh yeah and a few veggies. Did I mention summer fruit? I think I did, but in case you missed the newsflash, this summer I cannot. Stop. Eating. Fruit. There is something in it that has me hooked. So here I go again cooking up some fruit. Eric is normally not a fan of fruit with his main dish but he loved this! He went back for seconds, practically drowning his pork chops in this sauce. I loved this too, and we both agreed that the reason was that while the sauce has fruit it is not overly sweet. Just the right balance of sweet, sour, and savory flavors. The balsamic vinegar is a key ingredient in this dish, providing a nice balance of sweet and tangy profiles. Oh and if you don’t have cherry preserves on hand feel free to use some honey instead, it just might be a tad bit sweeter. You better act fast cherry season is ending soon! Heat 1 tablespoon butter in a large skillet over medium-high heat. Season the pork chops with 1/2 teaspoon salt and pepper, and dried herbs then brown in the hot butter until golden brown on both sides, about 2 minutes per side. Remove the pork chops to a baking sheet. Bake in the preheated oven until the pork chops are no longer pink in the center, about 10 minutes. 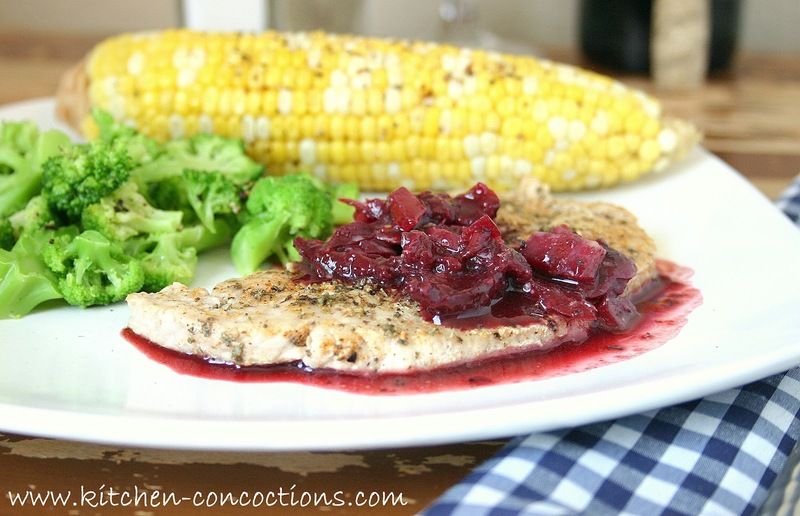 While the pork chops are baking, melt remaining butter in the same skillet over medium heat, and stir in the onion and cherries. Cook until the onion has begun to soften, about 2 minutes. Stir in the balsamic vinegar, cherry preserves and beef broth, and bring to a simmer. Simmer until the sauce has reduced and thickened. Season to taste with additional salt and pepper. 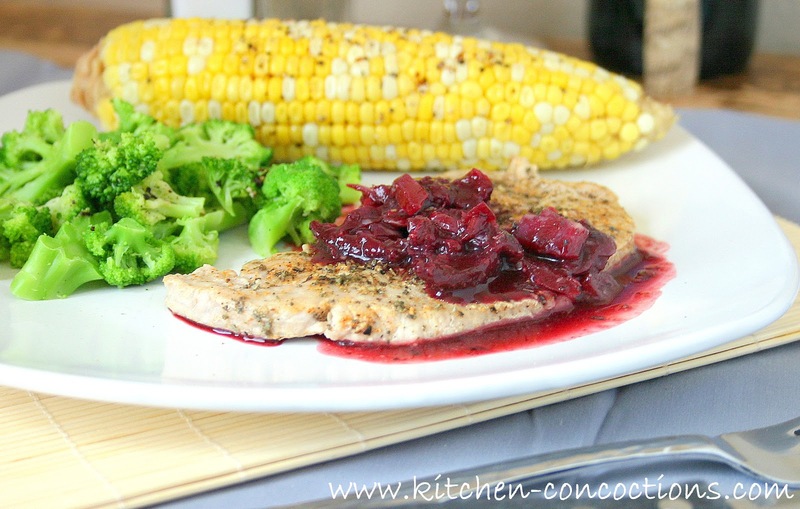 Serve cherry sauce over pork chops.